In the release v.0.5.6 of our desktop software analytics library, we added the ability to remotely track your program's exceptions in Google Analytics. When an exception is caught in your program, instead of just logging it locally, you can additionally call latSendException() to send the incident and its details to your Google Analytics property. From there, you can remotely monitor how your application runs and what kind (if any) of exceptions it throws. By monitoring other parameters like the OS version or the screen resolution, you can understand if there are platform parameters that trigger the exception and understand the reason behind it. This powerful view of what is failing at the users' computers, will enable you to quickly fix any errors, even before your users report them back to you. As always, the reporting is at the level of "reporting view" in your Google Analytics account. 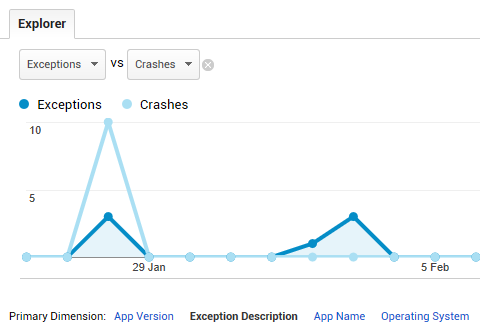 For the "Crashes and exceptions" menu to be there, your reporting view must be of the "Mobile App" type. If you do not already have a "Mobile App" view, create a new one. Below is a source code example (part of the cpp-demo-main.cpp) showing how you can send application's crashes and exceptions to Google Analytics. // Some things are called exceptions, but they are system (or processor) errors and not C++ exceptions.